Nova Bus celebrates a solid year with its Canadian partners in Montreal during the Trans-Expo 2015. “The CUTA Conference and Trans-Expo mark the end of another trade show season and a successful year,” said Ralph Acs, Volvo Buses, Senior Vice President Business Region Americas. “We focus on building long term business partnerships with Canadian transit agencies and we are clearly on track with the renewal of major contracts in 2015”. Nova Bus has received a firm order for 53 LFS Artic HEV buses plus options for 17 additional buses from members of the ATUQ corporation in Quebec, Canada. The joint procurement includes articulated hybrid buses to meet the growing public transit needs of two of the purchasing consortium’s members – Réseau de transport de la Capitale based in Quebec City and Société de transport de l’Outaouais based in Gatineau. In addition, the Toronto Transit Commission (TTC) has exercised options for the purchase of 108 additional 40-foot LFS with clean diesel propulsion system to be delivered in 2016-2017; over 70 40-foot buses had already been delivered earlier this year as part of this contract. 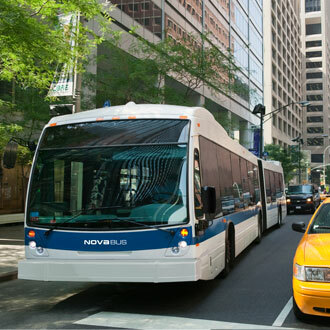 “These new orders from ATUQ and TTC clearly demonstrate the confidence of municipal authorities towards the quality and efficiency of our vehicles”, said Rob Mowat, Vice President of Sales, Nova Bus. “We are very proud to showcase once again our expertise and, in turn, contribute to the development of public transit in all regions of the country”, Mr. Mowat added. The Brandon transit agency from Manitoba established a new partnership for clean diesel 40-foot buses while Red Deer Transit in Alberta renewed its confidence in Nova Bus by ordering natural gas buses to complete its fleet. Other contracts include the renewal of partnerships with Keolis and Saskatoon and deliveries to BC transit, Brampton, Regina, St-John (New Foundland and Labrador) and Metrolinx agency, which coordinates transit vehicle purchasing initiatives for 15 municipalities in Ontario. To end the year, we invite the public industry to visit our booth at the upcoming CUTA conference. During the event, we will unveil the visual identity of our City Mobility project in partnership with the Société de transport de Montréal. Other City Mobility projects will be discussed during the conference of Jessica Sandström, Senior Vice President City Mobility, Volvo Buses.